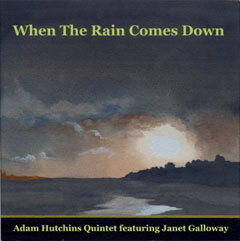 Janet is a professional jazz singer, session musician and educator based in Buxton, Derbyshire. She has a wide range of live experience from European tours with an indie band to Ronnie Scott’s with the Millennium Jazz Orchestra via community theatre, drama teaching & running an art gallery! As well as performing with Adam’s jazz ensembles, Janet is currently setting up a new music department for the University of Derby in Buxton, working with a 13 piece Funk band and teaching singing from her own studio at home. She is married with 2 children and 3 stepchildren. Jim Corry is a saxophonist who is quickly gaining an enviable musical reputation. He is equally comfortable on all the saxes and in a wide variety of musical genres. Most recently, Jim has spent much of his time touring the UK and Europe with artists as diverse as pop sensation Corinne Bailey Rae and 70s legend Roy Wood. Aside from this, Jim has managed to maintain a busy schedule of regular gigs in the North of England playing everything from Jazz to Funk and Latin American music. Emlyn is one of the young guns on the Leeds jazz circuit, having studied with Stevie Williams in Manchester then Richard Hammond & Zoltan Dekany on the BA Hons Jazz at Leeds College of Music. Since graduating in 2004 Emlyn has worked with numerous original jazz and function bands including the Red Hot Chartbuster tour, Omar Puente & Quintessential Swing plus his own creative projects Inertia Trio and The Grand Wizoo. He has performed at Southport & Newark jazz festivals, Jazz Cafe London and supported Ian Shaw & Alex Wilson. Hugh has been playing drums for 20 years and maintains a busy schedule of live playing, recording, and teaching. He has toured the UK and Europe with many groups including Salsa group AlmeidaGirl & Descarga and South African jazz band Skokiaan. Performing credits include backing many Motown legends: The Miracles, Lorraine Chandler, Troy Keyes, The Precisions, The Velvellettes and more. Hugh has played on several recordings; most notably the debut album by Almeida Girl & Descarga – ‘Llanita’, available from iTunes music store. Other performing credits include Gibraltar’s town square for New Years celebrations, Edinburgh International festival, the Berlin Marathon, Manchester Jazz Festival, Glastonbury Festival 2005 and Scarborough International Jazz Festival.